Robert and I have fallen into a pretty steadfast routine of dining out every Friday and Saturday and cooking meals at home Sunday through Wednesday. Thursday has always been our “do your own thing” night. Leftovers, frozen dinners, whatever random collection of edible items you can scrounge together are yours for the taking. As much as I enjoy cooking and dining out, I secretly look forward to Thursdays since it is sort of a night off for me. Since I’m not a fan of frozen dinners and I tend to save leftovers for lunch, I usually still end up doing some cooking. 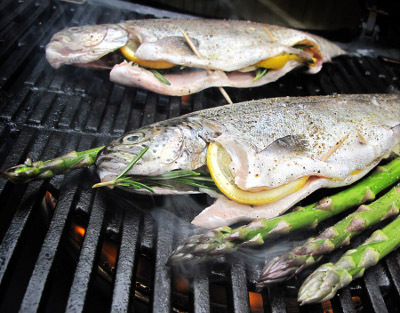 The key is finding meals that can be prepared in 20 minutes or less with minimal effort. My favorite Thursday meal is frozen potato pierogies with a side of sautéed cabbage and onions. It’s healthy-ish and quick to make. I can’t eat this every Thursday so I’m always on the lookout for new quick dinners. Enter Doenjang Jjigae. 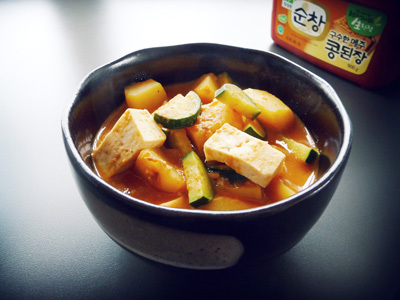 Doenjang jjigae is a Korean tofu stew made using fermented bean paste. It may not be as well known in this country as bulgogi and bi bim bap, but doenjang jjigae is a staple everyday dish in many Korean homes. The primary ingredient in doenjang jjigae is doenjang paste, a fermented soybean paste similar to miso although with a much coarser texture. In addition jjigae, doenjang paste is used as a general condiment and to make ssamjang, a sauce for Korean lettuce wraps. It is quite pungent and salty and may not be to everyone’s liking. If you love stinky, fermented foods like I do, you will probably enjoy this. Doenjang paste is sold in plastic tubs in Asian markets. Few people follow a strict recipe for doenjang jjigae—there are as many different ways to make it as there are cooks. The general procedure is simple. You start by making a broth. Koreans usually make their broth by boiling dried anchovies and kelp in water—a small handful of anchovies should be enough to flavor 2 to 3 cups of water. While the broth is going, portion out a spoonful of doenjang paste into a bowl. Start with a small amount and work your way up—it is quite salty so you don’t want to overdo it. 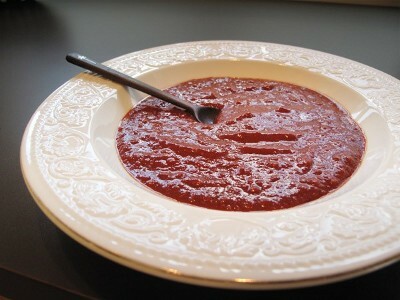 If you like, you can also add a dollop of the spicy red chili paste known as gochujang to the bowl along with the doenjang. After the broth has cooked for 10 minutes or so, strain out the anchovies and kelp. Add a small amount of the hot broth to the bowl and mash the doenjang paste with a fork to break it up. Add that mixture back to the pot along with whatever vegetables and proteins you are using and boil until done! 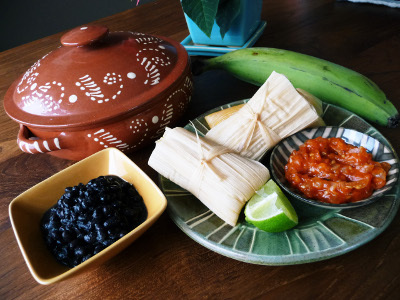 This is such an easy dish to prepare, and it’s so versatile. Most recipes call for potato, onion, zucchini and tofu, but I use this dish as a way to use up whatever ingredients I have leftover in the fridge that week. Doenjang jjigae can be made with anything from shrimp and corn and jalapeños to beef and shiitake mushrooms. I’ve tried it using a broth made from bonito flakes instead of anchovies—it was good but didn’t have the same pungent aroma (much to Robert’s delight, I’m sure). Doenjang jjigae isn’t meant to be served spicy, but I’ve been known to throw in some cayenne pepper when I’m craving something hot. 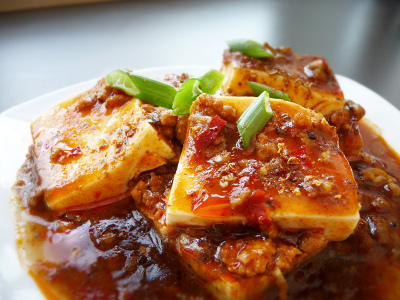 The one ingredient I do always try to include is the tofu just to keep things somewhat traditional and because tofu is so good for you. For a while now, I’ve been saying that Korean food will be the next big thing. Once people discover doenjang jjigae, it’s only a matter of time. This quick, adaptable, comforting dish is perfect for my Thursday night meals! Have you ever tried natto? If so, then you are most likely doing one of two things right now: salivating or plugging your nose and reaching to close your browser. Natto is one of those polarizing foods like cilantro and okra. People who have tried it tend to have extremely strong feelings about it. Natto is a traditional Japanese food consisting of soybeans that have been fermented with the bacteria, Bacillus subtilis. It is stinky in the same manner as some pungent cheeses (think Limburger). It is also known for its slimy, sticky texture. When stirred, natto develops lots of long, gooey strings. People go on and on about the smell, but I think it’s the unusual texture that really gets to folks. Don’t you want to try it now? I saw “natto gnocchi” on a restaurant menu recently, and it got me thinking about natto. My mom used to eat natto when I was a kid. Of course, back then I thought it was the worst thing ever. I would run out of the kitchen in horror every time she opened up a package. As an adult, I have grown to love all kinds of fermented foods. 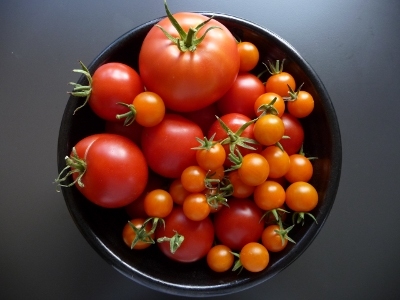 Kimchi, fish sauce, stinky cheeses – the riper and moldier it is, the better! I decided it was time to give natto another shot. I picked up a package of organic natto at Uwajimaya. In order to experience the true taste of natto my first time out, I decided to keep things simple by serving it over rice with soy sauce and a touch of spicy mustard. This is one of the most common ways of eating natto; so common, in fact, that most boxes of natto come with tiny packets of soy sauce and mustard inside. I can’t say that I loved it, but it certainly wasn’t terrible. It was surprisingly mild: stinky, yes, but not as much as certain cheeses. The beans themselves were quite bland. I think I enjoyed it less for its flavor and more for the thrill that comes with eating something others wince at. Plus, it is really fun to stir the natto and watch its crazy stringy texture develop. People typically either love natto or hate it, but strangely enough, I fall somewhere in the middle. Today, I was feeling experimental. I had some extra odds and ends in my pantry, and I thought, “why not mix them all together with some spaghetti and natto?” In a small bowl, I whipped the natto into a stringy, bubbling frenzy. Then I stirred in spicy mustard, tamari and a raw egg. I tossed this with hot spaghetti until it thickened into a sauce and coated all of the noodles. Then I added some edamame and chopped kimchi (because the natto wasn’t quite stinky enough for me). A drizzle of sesame oil and a sprinkling of black sesame seeds completed the dish. It may sound horrific, but it was actually pretty tasty. 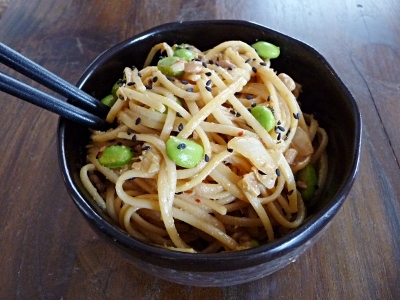 It reminded me a little bit of sesame noodles, albeit with a slimier texture and a flavor only a natto fan could love. If you like unusual foods, I dare urge you to try natto! Unless you’ve been living under a rock (or possibly down in a Dharma hatch) you’ve no doubt heard the news that Lost is ending tonight. People are hosting Lost parties all across the country in celebration of the series finale. I’ve been a fan of the show since the very beginning so I decided to do it justice in my own way: by preparing a Lost-inspired dinner. There are many routes one could take when planning a Lost-themed meal. The most appropriate choice would probably be wild boar cooked over a campfire. You could also do Korean food in honor of Jin and Sun. Or how about Mr. Cluck’s Chicken or Dharma issue ranch dressing for Hurley? Since the show is filmed in Hawaii, I decided to I decided to whip up a bunch of Hawaiian snacks. 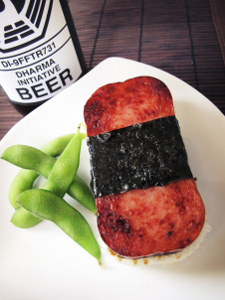 No Hawaiian snack tray would be complete without Hawaii’s famous surfer treat: Spam Musubi. Sushi rice topped with fried Spam – what’s not to love there? In addition, I chose to make Ahi Poke and Okinawan Sweet Potatoes with Miso-Tahini Dip. Rounding out the ensemble cast were steamed edamame and wedges of fresh mango. To drink, we kept it simple with Dharma-brand micro brews (OK, these weren’t real Dharma beers – Robert made some Dharma labels and slapped them on a couple of Ninkasi IPAs!) It is unlikely that the Lost finale will live up to everyone’s expectations. Regardless of what happens, at least I’ll have a delicious meal to look back on! Several months ago, I came across this irresistible-sounding recipe for Jamaican Veggie Patties. It comes from Bryant Terry’s new cookbook: Vegan Soul Kitchen. Jamaican patties are traditionally filled with ground beef, but this vegan version features a delectable mix of vegetables cooked in coconut milk and sweet spices surrounded by a flaky, coconut oil-rich crust. My first attempt at this recipe yielded mediocre results. The filling was great, but I completely messed up the crust (my own fault, not anything to do with the recipe as written.) The crust recipe calls for chilled coconut oil. Having never used coconut oil before, I decided to put it in the fridge to chill overnight – the colder the fat, the flakier the pastry, right? Big mistake! The coconut oil hardened up so much that I couldn’t even get my knife through it. I let it soften for a while at room temperature, but I still had a tough time incorporating it evenly into the dough. Not surprisingly, the crust wasn’t very good. It turned out dry and crumbly rather than flaky. At least the coconut oil made my hands nice and soft! I divided the filling into two 2-cup soufflé dishes, topped them with the crust, brushed on a little egg wash and baked them in a 350-degree oven for 45 minutes. Except for my slightly misshapen crust, the pot pies turned out beautiful! The turmeric gives the crust a nice golden color. They were very rich and flavorful and provided some much-needed comfort on our first stormy night of fall. 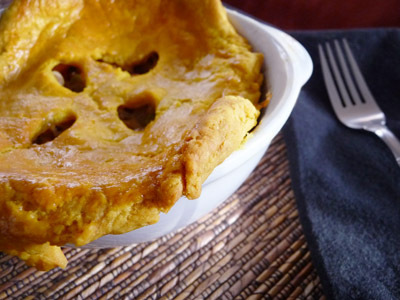 Jamaican pot pies – a unique twist on an American classic! Last weekend, my sister and her husband threw a big bash in celebration of their 11th wedding anniversary. Of the several desserts served at the party, the highlight for me was the coconut cream pie courtesy of Dahlia Bakery. Chef Tom Douglas has been serving this pie at his Dahlia Lounge for nearly two decades now. It has developed quite a following here in Seattle. 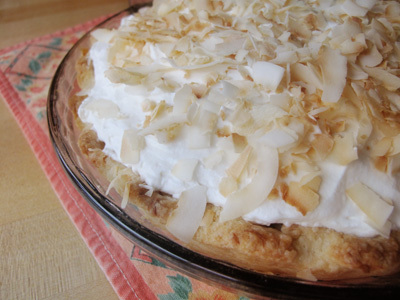 Even people who don’t normally like coconut cream pie are said to have become converts upon tasting Tom’s version. When I mentioned to my mom that I had the recipe, she said, “Great, then you can make it for our Easter dinner next weekend.” Doh! For the most part, the pie was a breeze to prepare. You make a simple pastry cream using milk, sweetened coconut, fresh vanilla bean, eggs and butter. The pie crust – a basic butter crust that is spiked with more sweetened coconut – is blind baked in the oven. Once the crust has cooled, you simply fill it with the pastry cream and top it with whipped cream and even more coconut! The filling turned out great, but my crust ended up a bit doughier than I would have liked. My ingredients might not have been chilled properly or perhaps I simply under-baked the crust. Or, it could be that the shredded coconut in the pie dough results in a softer, less flaky crust. If I ever make this recipe again, I would probably try a plain pie crust instead – the extra coconut flavor in the crust really isn’t necessary. After a lovely Easter dinner, it was time to try my pie! My family seemed to enjoy it despite the less than perfect crust. Everyone agreed that my pie had an even richer coconut flavor than the version we had sampled the previous weekend. Robert and I ate the leftovers last night – after sitting for a day and a half in the fridge, it still tasted pretty damn good! Tom Douglas’ Triple Coconut Cream Pie recipe can be found in the Seattle Kitchen cookbook and has also been written up here and here.